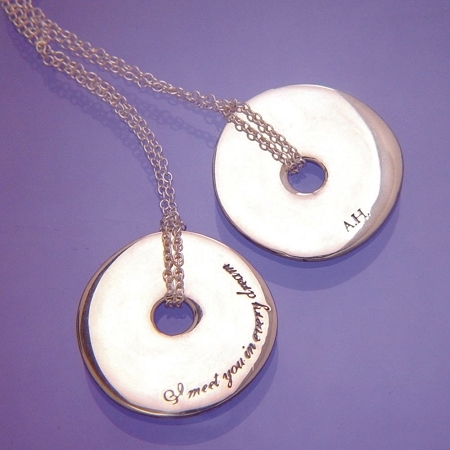 This modern sterling silver pendant is inscribed with a delightful quotation from Hamilton's intimate letter to Elizabeth Schuyler, dated October 5, 1780, only a few weeks before their marriage. It displays his elegance as a wordsmith, his charm and his humanity, often forgotten among the great issues of military history and statesmanship for which he is best remembered. Hamilton's complete sentence reads: "I meet you in every dream - and when I wake I cannot close my eyes again for ruminating on your sweetnesses." Pendant measures 1" diameter. 18" sterling silver chain.